3. Hello Physics World ! This is the 3rd ODE (Open Dynamics Engine) tutorial. ODE is simulation using this to the basic flow associated with the API. The sample program as the most simple physical simulation covered by falling objects. Programming is a textbook example is the first Hello World example to show the need. This is the physical simulation version of Hello World. ODE simulations of a typical flow associated with the API enumeration. Then, please read the following source code. This is a red ball of a free fall program. The flow of the ODE simulation is as follows, first, dInitODE () initializes ODE. Next, create the dynamic world (World) by calling dWorldCreate () . The gravity is set by dWorldSetGravity(world,0,0,-0.001). In this case, the gravity vector is set to (0, 0, -0.001) that makes objects falling very slowly. dBodyCreate is called to create a rigid body, then initialize a mass parameter, calculate and set it. Set position of the body by dBodySetPosition(). The simulation is executed by the simLoop function. This function is call in every simulation step. dWorldStep(world, 0.05) steps is a single step. The second argument is a time step. In this case, 0.05 seconds is stepped. dsDrawSphere() shows a sphere in your computer screen. At the end of the code, clean up the simulation. dWorldDestroy(world) destroys the world, and dCloseODE () closes ODE. The function begins with a lowercase ‘d’ is the ODE API (application program interface), and, ‘ds’ is the Drawstuff API. The Drawstuff is the graphics library for demo programs of ODE. You can download sample1-110105.zip from here, build and run! Visual C 2008 and the Code:: Blocks 8.02 for the project files are included. This sample program simulates a free fall. 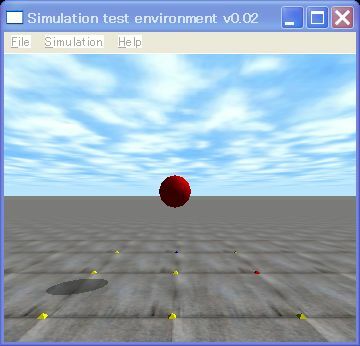 A red ball falls and disappears because of lacking the collision detection function. Next time, we learn how to use the Drawstuff which is a simple 3 D graphics library based on OpenGL. Create a rigid body and return the ID number of it. Get the center of gravity of the body, and return the pointer of it. Get the rotation matrix and return its pointer. Set the mass parameter to the body. Set the position (x, y, z), the absolute coordinate system, to the body. Set the rotation matrix R to the body. Create a box with the size of (lx, ly, lz) according each x, y, z axis, and return its ID number. Create a plane which is described by ax+ by+ cz = d, and return its ID. Two attributes of the object are a geometry and a body. This API associates both. Create a hash space for collision dectection and return its ID. Contact points are stored in the joint group. This API empties the joint group. Attach the joint to body1 and body2. Create the joint group and return its ID. Calculate the mass related parameter, i.e. the moment of inertia, of the box with the size of (lx, ly, lz). Call the callback function, callback, which is used for the collision detection. Create the dynamics world and return its ID. Set the acceleration of gravity (x, y, z) [m/s^2] to the world. Step a single simulation. The second argument step_size[s] is integral step time. Draw the box with the position pos, the rotation matrix R and the size of sides. Set the view-point of the camera. xyz are xyz positions[m] and hpr are heading, pitch, roll [°]. Call the simulation loop. the first and the second argument are arguments from the main function, the third and fourth argument is the size of the window (width: w, height:h), fifth argument is the pointer of the drawing function.